Today's Handmade Holiday Giveaway is doing double duty as a blog tour stop for Modern Top-Down Knitting . To say I'm excited about this review/giveaway would be an understatement. I have a copy of the book sitting shiny and new right in front of me, just waiting to be packaged and sent to a lucky reader. It will be perfect for making an extra special handmade gift, or for passing along to your favorite knitter. I know you're going to love it. At first glance, the projects and patterns in this book might appear too difficult for anyone but the expert knitter. But a quick read through the introduction will make you believe otherwise. 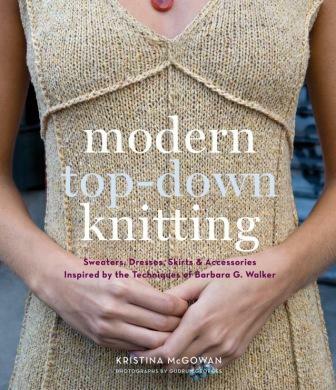 The author, Kristina McGowan, describes her own journey into top-down knitting using the techniques and philosophies pioneered by, Barbara Walker . Kristian explains her own reservations about using Walker's book and later learning that "not only were no elaborate skills required, but the ideas were exiting and revelatory..."
The beauty of these patterns is that being made from the top and often in-the-round makes it possible to try on the garment while it is being knit giving you full control of length and fit. Also, and this is a big seller for me, there is no seaming! I hate seams. The three key techniques used for this kind of knitting are the provisional cast on- short row shaping, and sitting in sleeves seamlessly. Each of these techniques are thoroughly described with plenty of pictures to help you along. I really wish I had been wearing these when we pulled up to our house yesterday. 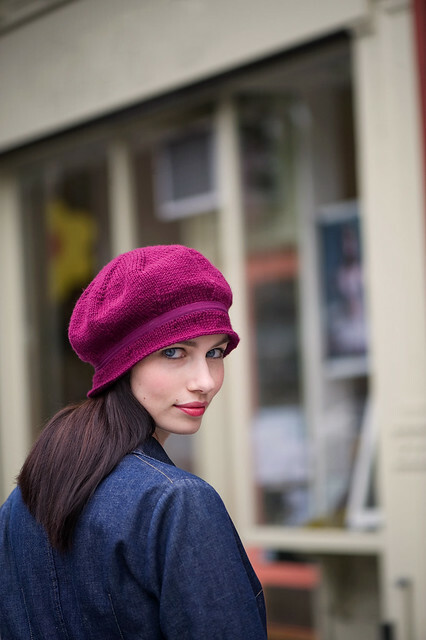 This hat is not only a gorgeous pattern, but would make it in exactly that color. Mmm, I love tunics. Don't you? One lucky Narrating Life reader will receive a copy of Modern Top-Down Knitting: Sweaters, Dresses, Skirts & Accessories Inspired by the Techniques of Barbara G. Walker courtesy of STC. :: Check out the other blogs on the blog tour for Modern Top-Down Knitting here as well as the project gallery here. :: Leave a comment on this post: What is first on your holiday to-do list? :: Post a Handmade Holiday button on your blog or website for an extra entry. Please leave another comment letting me know you did so. Congratulations Anna! Please email me ASAP to claim your prize! P.S. The next stop on the blog tour is the lovely Knit-a-While. Be sure to head over there tomorrow for a Q & A! First on my holiday to-do list is to make list of items stil to make vs buy. Then I will work on getting my cards out! I'm finally joining the series! I've been poking in for the last month and can't wait until I have time to read through all the posts and ideas. Love it! My first holiday to-do is to enjoy the season while pushing through finals. I'm going to find small ways to celebrate until I can go full out once school is out! First on my list is having our Christmas letter site ready for business tomorrow! Oh my can I say I am totally drooling all over the place....seriously! I am also adding that amazing button as well because I can just see myself during the Christmas break...book in hand ready to create that amazing hat! What a great book! I guess the first thing on my list is making a list! I have already made/bought some gifts so now I just have to remember what I have, and think of ideas for everyone else. This is an awesome giveaway and I love the designs I've seen on ravelry. First on my holiday list is buying tickets to go 'home' to my parents' - or it should have been shipping all the international parcels that are currently occupying my entire desk. I like to send cards via snail-mail, so the first thing to do is writing my best wishes and sending them to Europe so my friend get them on time for the holidays. Geez, how is it that despite my total knitting-obsession, I have managed to completely overlook this book? I have to buy supplies to make ornamements. Trim the tree. Checked that off tonight.Yay! Would love to win this! Thanks, Miranda for such a fun event. My holiday preparations have been in full swing for a few weeks now, but next on my list is to buy Christmas PJ's for Rhea and the next ornament in my series before it disappears from shelves. Christmas tree-tonight! Next up-finishing my Christmas cards. The first thing on my holiday to-do list was to knit a quick shawlette as a gift for my mom and I finished it! Next on my list is decorating, I'm almost mostly done with my shopping. And I have a button already for your Handmade Holidays on my blog - I love the tutorial roundups this time of year!